Purchased March 1940 from the artist by (Paul Rosenberg and Co, New York); sold November 1951 to Robert von Hirsch [1883-1977], Basel; (his estate sale, Sotheby's, London, 26 June 1978, no. 751); purchased by (John Baskett, Ltd., London) for Mr. and Mrs. Paul Mellon, Upperville, Virginia; gift 1985 to NGA. This painting was confiscated by the ERR in 1941 with others from the Rosenberg collection in France (see inventory of Rosenberg-Bernstein collection, National Archives RG260/Box 470/file XI, and ERR inventory card UNB322, National Archives RG260/Property Division/Box 22, copies NGA curatorial files). Documents from the National Archives in Washington indicate that the painting was selected by Hermann Goering on 3 March 1941 from the Jeu de Paume (OSS Consolidated Interrogation Report #2, The Goering Collection, 15 September 1945, Attachment 5, 2. Nachtrag zur Liste der für die Sammlung des Reichsmarschalls Hermann Göring abgegebenen Kunstgegenstände, dated 9 April 1943, no. 6, National Archives RG239/Entry 73/Box 78, copy NGA curatorial files). Goering is documented as having traded the painting to Gustav Rochlitz, who claimed to have sold it to Hans Wendland (OSS Consolidated Interrogation Report #1, Activity of the Einsatzstab Rosenberg in France, 15 August 1945, V: Details of Exchanges, exchange #1, item no. 7, National Archives RG 239/Entry 74/Boxes 84-84A and OSS Detailed Interrogation Report #4, Gustav Rochlitz, 15 August 1945, Einsatzstab Confiscated Paintings Sold by Rochlitz, no. 30, National Archives RG239/Entry74/Boxes 85-85A, copies NGA curatorial files.). However, according to Wendland, the Matisse remained with Rochlitz (OSS Detailed Interrogation Report, Hans Wendland, 18 September 1946, pp. 14-16, National Archives RG 239/Entry 73/Box 82, copy NGA curatorial files). Further documentation at the National Archives supports Wendland's claim. The picture is not among those known to have been sent by him to Switzerland with others from the same sale from Rochlitz (see Douglas Cooper, Report of Mission to Switzerland, 10 December 1945, pp. 8-9, National Archives RG 239/Entry 73/Box 82, copy NGA curatorial files). Moreover, in a letter dated 18 January 1945, Paul Rosenberg's brother Edmond states that by that time the picture was in a private collection in Paris, having been sold by the dealers Kohl and Renoux of rue Faubourg St. Honoré, Paris (Rosenberg claim file, National Archives RG260/OMGUS/Records of the Museum, Fine Arts and Archives Section/Cultural Property Claims Applications/ Box 743, copies in NGA curatorial files). Hector Feliciano, in The Lost Museum, New York, 1997, p. 121, reports that Matisse himself had seen the picture for sale in Paris in 1942. The picture was returned to the Rosenbergs (per telephone conversation with Rosenberg archives 16 March 2001) who later sold it to von Hirsch. Henri Matisse: A Retrospective, The Museum of Modern Art, New York, 1992-1993, no. 333, repro. Henri Matisse: Processus/Variation, The National Museum of Western Art, Tokyo, 2004, no. 94, repro. Henri Matisse: Figur Farbe Raum [Henri Matisse: Figure Color Space], Kunstsammlung Nordrhein-Westfalen, Düsseldorf; Fondation Beyeler, Basel, 2005-2006, no. 167, repro. (Düsseldorf cat. ), fig. 110 (Basel/French cat. ), fig. 114 (Basel/German cat.). Déja Vu? Revealing Repetition in French Masterpieces, The Walters Art Museum, Baltimore; Phoenix Art Museum, 2007-2008, no. 64, fig. 15. 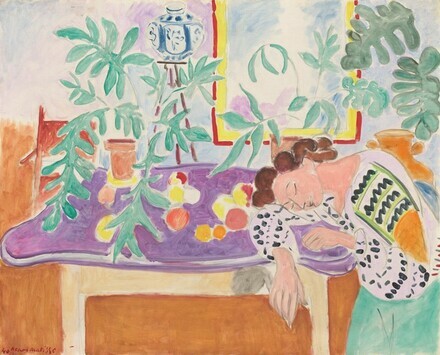 Matisse: 1917-1941, Museo Thyssen-Bornemisza, Madrid, 2009, no. 67, repro. L'Art dans la Guerre. France, 1938-1947, Musée d'Art Moderne de la Ville de Paris; Museo Guggenheim Bilbao, 2012-2013, unnumbered catalogue, repro. Matisse and Friends: Selected Masterworks from the National Gallery of Art, Denver Art Museum, 2014-2015, no catalogue. Matisse, la figura. La forza della linea, l'emozione del colore, Exhibit Halls, Palazzo dei Diamanti, Ferrara, 2014, no. 60, repro..
Strick, Jeremy. Twentieth Century Painting and Sculpture: Selections for the Tenth Anniversary of the East Building. Washington, D.C., 1989: 58, repro. 59.